On the eighth episode of The UrbanCincy Podcast, Mel McVay from Cincinnati’s Department of Transportation and Engineering joins the UrbanCincy team to discuss bicycling in the city. We learn how the city decides when and where to install sharrows, bike lanes, and cycle tracks, and how the city deals with narrow streets, challenging geography, and on-street parking when planning bike facilities. We speculate on future plans for the I-75 corridor and Western Hills Viaduct, and get a preview of several improvements coming soon to that corridor. We also discuss how far Cincinnati’s bicycling culture has come in the past several years, such as the booming popularity of the Thursday Night Slow and Steady ride, the Urban Basin Bicycle Club, and several other themed bicycle events. 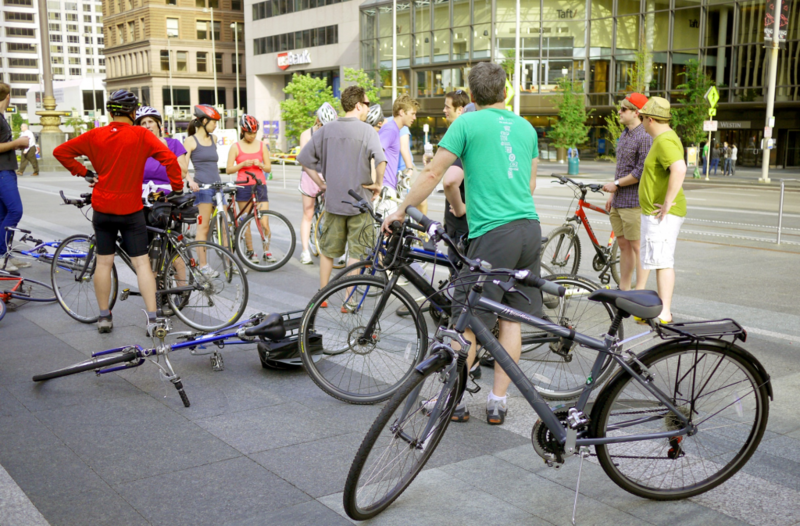 Photo: The Urban Basin Bicycle Club gathers on Fountain Square before departing for a ride through the center city. Photograph by 5chw4r7z.